Imagine if Buffy Summers punched a demon into another dimension, and in return got her hands on a star-shaped crystal that plunged her into a funhouse-mirror, Buffy-verse version of Sailor Moon. That, give or take a few school grades, is Disney XD’s Star vs. the Forces of Evil, which returns this weekend with the first of a full month of new episodes. And it is just as goofy, girly, badass, and morally complex and full of philosophical absurdity as such an extremely wild mash-up would imply. Look, I get that boldly invoking the name of the OG Chosen Blonde Ones (Buffy especially) is both easy to do and hard to sufficiently back up, but I am not a crackpot: Titular magical teen warrior princess, Star Butterfly (The Middle’s Eden Sher), may not fight vampires, but she does have an off-again, on-again demon boyfriend, Tom Lucitor (Boy Meets World’s Rider Strong), the punk rock Prince of the Underworld who struggles with lethal anger issues. Her magical/martial education isn’t overseen by either a British representative of a patriarchal Watchers’ Council or a feline representative of the Moon, but starting in Season Two she does have the questionable guidance of the her Butterfly Spellbook’s schlubby, immortal, homunculan avatar, Glossaryck (originally Jeffrey Tambor, but easily replaceable for Season Four due to… magical ailments). And while none of the universes she uses her dimensional scissors to travel to seem to contain vampires, she does fight hordes of monsters (led by Alan Tudyck and Michael C. Hall) with her eternally loyal, non-magical best friend, Marco Diaz (Adam McArthur), glued to her side. 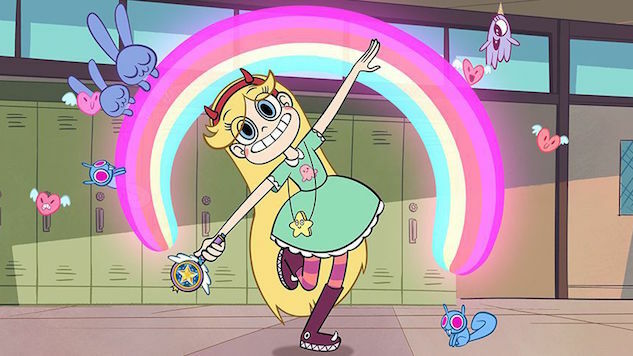 Star’s best non-magical female Earth friend, meanwhile, is basically a weird, witchy cross between Willow and Faith, and her best magical Mewni friend, Ponyhead (Jenny Slate), is basically Anya—you know, were Anya a floating unicorn head whose greatest desire was clubbing rather than wreaking vengeance on bad men. Star’s magical wand is a scepter topped with a celestial orb, and her magical transformations into her more powerful Butterfly forms happen in a burst of light and an enveloping of magical ribbons. Like Usagi, she is descended from a long line of powerful queens; like Buffy, she is the descended from a long line of Chosen Ones whose magical provenance is supes shady vis à vis, you know, moral purity. Like both, she has no respect for the constraints of princessly expectations or good manners. Ultimately, though, those many pivotal pop culture allusions are just the spoonful of sugar to get the nostalgia crowd in. Star vs. the Forces of Evil is metal as heck on its own merits, operating in the landscape of modern kids’ animation as one of those joints that, like its Disney XD cousin, Gravity Falls, is stealthily about a lot of big moral ideas, all wrapped up in very small, very absurdist ones. The series may revel in the silliness of Star’s signature narwhal blast!! and spider-with-a-top-hat-on!!! battle spells, but since the moment in the pilot that Star’s parents banished her to Earth for a year of wayward princess rehabilitation, the show has made it clear that, while Star is young and goofy and interested in boys and partying and friends and fighting monster hordes as much as any teen girl would be, its true subject is the nature of human decency, and what it means to both participate in and responsibly rule over civil society. Segregation and the dehumanization the Other; monstrous orientalism; the social constructs of gender roles and race; intergenerational conflict and the role of legacy; the inherency of evil; punishment versus forgiveness and rehabilitation—all are major themes Star vs. the Forces of Evil tackles. In Season Three, Star is on a one-woman mission to re-integrate monsters into Mewnan society, an uphill battle Marco verbatim describes as an effort to counter “centuries of bigotry and social biases.” The series’ long-game “villainess” is a Butterfly queen who defied social convention three hundred years ago and was sentenced to eternal crystal imprisonment for no legitimate reason anyone can make Star understand. Queen Eclipsa fell in love with a monster and had a baby with a tail, and somehow that is morally unconscionable, but one of the members of the magic council is a hothead with literal snakes for hands, and somehow he’s allowed to not only escape being called a monster, but to pass judgment on everyone else who could be? Star can’t be the only one who sees how inconsistent and unjust that is, the show says, and it’s right: The kids in the audience, too, won’t be able to see the hypocrisy as anything but. So anyway, Star vs. the Forces of Evil comes back on March 3, and if you have any history of loving Buffy or Usagi-chan, you should give it a shot. Seasons One and Two are available on Hulu, and all episodes of Season Three (save for the first three “Battle of Mewni” installments) are available on the Disney Now app. This is the one where Star shows up on Earth and takes up residence in a magical tower glommed on to the Diaz family’s suburban home. Also, Jenny Slate’s very unsettling Ponyhead appears and enters immediately into a battle of friendship with Marco. In the long run, you can take it or leave it, but if you’re going to watch the show at all, you might as well include the starter. This episode includes the first real introduction to Star’s ex-boyfriend, Tom, and his long character arc of struggling to overcome his anger issues, as well as the first evidence of the depth of Star and Marco’s emotional friendship. The second half of the episode, “Fortune Cookies,” finds Star at her most magical-teenaged weird, taking Marco at his word that fortune cookies are Earth’s version of magic and only following their instructions, while Ludo (Alan Tudyk) tries (and fails) to use this unwise turn of attentiveness to his monstrous advantage. This is not a series that is particularly interested in gender essentialism of any kind. In the very first episode, Ponyhead invokes the name of St. Olga’s as a kind of boogie man that princesses like she and Star have faced their whole lives. In this episode, when Ponyhead gets sent there at last, we see that St. Olga’s is a grim, asylum-like place that uses Clockwork Orange-level behavioral modification to remove all individuality and agency from young princesses. Marco joins Star to go undercover and rescue Ponyhead, and as Princess Marco Turdina manages to incite revolution (battle cry: “Its not criminal! To be an individual!”) and overthrow the school’s malicious dean, Miss Heinous. While the ugly little incompetent, Ludo, is presented as the Season One villain from the start, it is ultimately the lizard monster Toffee (Michael C. Hall) who is the real threat, and this is the big season-ending battle against him, which sets up the magical mystery and greater conflict for Season Two. That greater conflict being the fact that Star’s wand crystal splits in two, with half ending up in Ludo’s control. This season opener is of a sort that the series takes up after this, splitting time from Star and Marco as the central heroes to focus on the arcs of ancillary characters like Ludo or Star’s parents or Buffrog the tadpole monster Dad or even the magical critters in Star’s wand, and examining how the social constructs of Mewni and the Butterfly magic impact their lives. Tom and Marco are set up as antagonists early on, but as this episode shows,that kind of possible love-triangle antagonism isn’t necessary to tell an interesting story, about teens or otherwise. There is also an anger counselor dressed as a tiger, and a zombie karate movie star. The second half does that focus-shift thing to Buffrog, and his investigation of the same magic-draining mystery Star’s mother is obsessed with all season. Star’s wand is on the fritz throughout Season Two, so in this episode she enters the wand to try and figure out what’s there that shouldn’t be that’s causing all the trouble, and in so doing enters a kind of twilight zone where she has to battle multiple versions of herself, and where she learns about the greater mythology of the Butterfly Queen history that her mother has either elided or straight up lied about—including Queen Eclipsa’s entire existence. This four-part season opener finds Star and Queen Moon on the run as magic drains from Mewni and Ludo/Toffee gain the upper hand, King River (also Alan Tudyk) loses control of the castle, and Marco and the artists of Mewni stage une Résistance. It ends with Star leveling up to a six-armed butterfly monster version of her magical soul-self, which is a great counterargument side-eye to the sexifying transformation Sailor Moon undergoes in the anime that inspired Star. In the first half of this episode, Marco, Star and Ponyhead return to the brand new St. Olga’s for an anniversary celebration in Princess Marco’s name, while Miss Heinous also returns to reveal Marco as the fraud he is. She fails, because Mewnans do not care about gender essentialism. The second half finds Star at her wit’s end trying to understand monster designations and segregation, and her seeking out the kingdom’s monster expert—whose myopically colonial academicism is like an anthropology grotesque, and highlights just how unjust and illogical the Mewni system is. And that’s where Star vs. the Forces of Evil picks up, this Saturday morning at 11 a.m. ET on Disney XD. Do tune in. Star’s gonna have a good time.